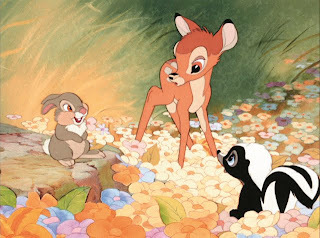 While the early onscreen declaration in Bambi that “it isn’t every day a prince is born” is a direct response to the recent arrival of the adorable eponymous white-tailed baby deer which opens this Disney film, the same intriguingly apt observation might just as well have foreshadowed the plethora of princess-centric House of Mouse titles that would follow the 1942 classic. 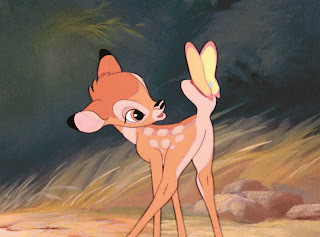 Likewise, as opposed to the heightened storybook palette used in some of Disney’s brighter works that focused on royal beauties whether asleep or under the sea , Bambi is much more naturalistic in its artistic technique, emphasizing realism to such an extent that it required approximately five years to finish after Walt obtained the rights to the Austrian novel from MGM in '37. An understated and unabashedly sensitive coming-of-age tale, Bambi unfolds throughout the seasons and is bookended by the same “circle of life” motif the studio would circle back to on a grander, Shakespearean scale fifty-two years later in The Lion King . 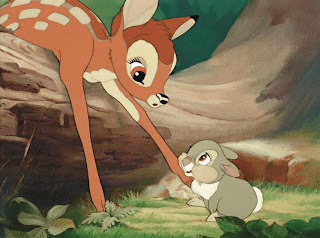 Yet unlike the epic approach utilized in the Hamlet inspired Lion King , Bambi is a relatively quiet film save for instantly memorable segments that alternate from pure comedy as Thumper teaches the clumsily young Bambi to “skate” with his paws to tearful tragedy in the heartbreaking sequence wherein Bambi discovers that human hunters have left him without a mother. 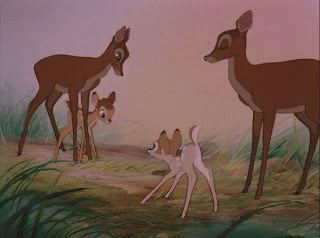 Likewise, particularly because animated films are aimed at children and the trauma experienced by Bambi is one of those childhood rites-of-passage most of us still discuss today, ultimately it’s the tragic loss of a parent we remember most. However, when viewing it again today, it’s obvious that our visceral memory of the sequence in question is worse than it actually is due to the restraint and care taken by director David Hand and producer Walt Disney in minimizing how much we see to make it even more emotionally powerful. 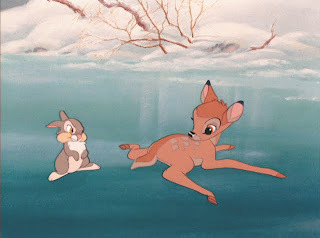 As the studio’s only release during World War II, Bambi proved a little too melancholy for audiences seeking escapist fare but thankfully and deservedly, appreciation for the landmark production has grown over the years to the point that it was selected by the American Film Institute as the third greatest animated film ever made. And thanks to a painstaking digital restoration that preserved every frame of the original ’42 effort in stunning visual and audible high definition clarity, we can now experience Bambi the way that the studio intended in this breathtakingly beautiful Diamond Edition Blu-ray Combo Pack . In addition to unveiling the company’s brand new “Disney Second Screen” application that gives you the opportunity to view with film in a variety of ways with the addition of an extra screen on another device, the Diamond Edition features a treasure trove of bonus features that take you behind the scenes to discover how the film was made from storyboard to final illustration. 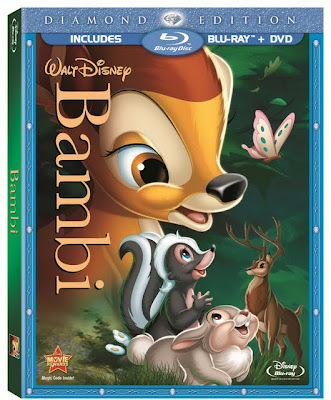 A deceptively simplistic yet poetic representation of life divided into verse-like seasons, the irreplaceable and unforgettable Bambi makes a wonderful addition to the studio’s stellar high definition collection of timeless classics.